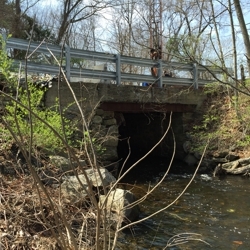 Hoyle, Tanner is excited to announce that we have partnered with WorldTech Engineering, LLC to develop a plan and engineering design for the repair and/or replacement of two adjacent 12’ span bridges over the Nonacoicus Brook in the Town of Ayer, Massachusetts. The Town’s Department of Public Works recognizes the need for significant improvements to both the West Main Street and the Shirley Street Bridges, and the importance of maintaining the crossing provided to the Town by these two bridges. The Shirley Street Bridge has been closed at the recommendation of MassDOT since 2014 due to a severe wash out, while the West Main Street Culvert, essential in maintaining traffic on West Main Street, is of comparable age and condition. Hoyle, Tanner completed a structural inspection and evaluation of the West Main Street Bridge in the fall of 2015, and presented recommendations to the Town for short-term maintenance and long-term repair of the bridge. Following these recommendations, the Town has elected to proceed with a project that encompasses both the West Main Street and Shirley Street structures. As the bridge design lead for the project team, Hoyle, Tanner will aid in the Town in the following areas: preliminary hydrologic and hydraulic analysis and design, preliminary bridge design, final bridge design, and permitting assistance. Hoyle, Tanner’s goal is to work with the Town to evaluate alternatives for replacing the West Main Street Bridge, paying close attention to public safety and transportation efficiency. Additionally, alternatives for the replacement/repair, or possibly removal, of the Shirley Street Bridge in relation to the West Main Street Culvert will be considered. We look forward to partnering with WorldTech Engineering, LLC in order to help the Town meet its transportation goals!